The great saint of Sialkot, Imam Ali-ul-Haq, better known as Imam Sahib, lived in the 13th century, during the reign of Feroz Shah Tughlaq (of the Tughlaq Dynasty). He is reputed to have converted a majority of the local population to Islam. Imam Sahib battled against Raja of Sialkot and martyred. 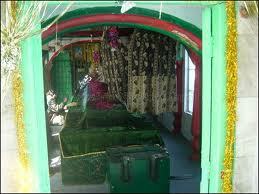 Hazrat Imam Ali ul Haq's shrine is also situated in Sialkot city at the place where he was martyred. The path leading to the tomb is often lined with numerous prostrating pilgrims. The mausoleum complex is a maze of narrow corridors leading to several shrines of pirs (holy men). The tomb of Imam Ali-ul-Haq is to the right, through a mirrored gateway tiled with Quranic inscriptions and geometric designs. The courtyard is a fascinating place to sit and absorb the atmosphere. To the rear is a small graveyard where drumming, devotional singing and dancing takes place. The market outside is very photogenic and a large flat roof at the entrance to the shrine offers a panoramic view of the deals being struck. Imam Ali ul Haq was the 14th Caliph of Hazrat Ganj Shaker (RA). Hazrat Ganj Shaker lived his life during the reign of Emperor Bulban, therefore this source shows that Imam Sahib was from the era of Emperor Bulban. Both the emperors have time difference of 90 years. However, some other sources show that Imam Sahib participated in numerous holy wars during the era of Emperor Taghaluq, therefore as a whole, it can be said that Imam Sahib most probably lived his life during the time of Emperor Taghaluq. Imam Ali ul Haq By ContributorOne | Mar 23, 2012 A biography of Hazrat Imam Ali ul Haq (RA) of Sialkot. It is law of nature that whenever there is genocide from those who are powerful to the poor people, Allah Almighty has bestowed His mercy on those by sending His holy & noble saints to the poor, who guide them to victory and prosperity against the suppression. Imam Ali ul Haq (RA) was one of those sufi saints, who was sent to enlighten the name of Islam. Locally, Imam Ali Ul Haq is better known as "Imam Sahib". There is not clear information about the birth year and place of Imam Sahib , however there are different sources, which come closer to his birth place & time. For example, Mr. Naveed Sultan in his book "Sialkot in the mirror of spirituality" says, that Imam Sahib was born at Bait-ul Fuqra in the city of Delhi at the time of Emperor Feroz Shah Taghaluq. While some other sources, for example an old book of sufi saints, named "Dynasty of The Prophets", one copy of which can be found today with Sufi Ghulam Fareed Moza Chitti Sheikhaan, says that Imam Ali ul Haq was the 14th Caliph of Hazrat Ganj Shaker (RA). Hazrat Ganj Shaker lived his life during the reign of Emperor Bulban, therefore this source shows that Imam Sahib was from the era of Emperor Bulban. Both the emperors have time difference of 90 years. However, some other sources show that Imam Sahib participated in numerous holy wars during the era of Emperor Taghaluq, therefore as a whole, it can be said that Imam Sahib most probably lived his life during the time of Emperor Taghaluq. Those historical incidents are narrated as under, which are further confirmed by Mr. Ashfaq Niaz in his book "History of Sialkot". Mr. Naveed Sultan in his book "Sialkot in the mirror of spirituality" says, during the reign of Taghaluq, Sialkot, was ruled by a Hindu Raja Sahenpal. To protect the city from enemies & the castle from the invaders, Raja started constructing a safe guard wall around the castle. By unknown reasons, Raja daily used to construct the wall, which used to fell down in the same evening. This mysterious process went long for so many days. Raja was very worried about the wall. He asked for solution from his hindu courtiers. The courtiers suggested Raja that the wall will not be constructed until unless blood of some pious Muslim is shed over the wall. Raja accepted the suggestion and started looking for a pious Muslim. One day, a muslim young man named Murad Ali was caught offering ablution on the bank of stream Aik, which flows even now through the city. The Raja army arrested the young man and martyred him. His head was graved under the northern wall of the castle. After this genocide, walls of the castle were constructed which didn't fell afterwards. The mother of Murad Ali, Maee Rasti cried and asked for revenge from that time sufi saint Hazrat Malik Shah wali (RA). He advised the mother to go to Madina (holy city of Saudi Arabia). Maee Rasti replied that she was a very poor woman and was not able to go to Madina. Hazrat Malik Shah Wali (RA) said to close her eyes. When she opened her eyes, she was in Madina, where her prayers were accepted. From Madina she reached Delhi in the same way. Mai Rasti reached the court of that time emperor Feroz Shah Taghaluq in Delhi and asked for revenge. The emperor was very sad to hear about her story. Imam Ali ul Haq (RA) was the royal guest of the emperor at that time. The emperor asked Imam Ali ul Haq (RA) to take revenge from Raja. Imam Sahib (RA) immediately formed an adequate brigade of army and started his journey towards Sialkot for Jihad. He was accompanied along with his courageous brothers. When the army reached at Jalandher, his brother Imam Nasir died of illness. He graved his brother at Jalandher and the army marched forward. When the army of Imam Ali ul Haq (RA) reached Jagat Pur (now-a-days Pasrur), the muslim army fought its first battle with the knights of Raja Sahenpal. Although, the enemy was great in number, but still they lost the battle. Imam Sahib (RA) brother Meeran Barkhudaar fought courageously, killed numerous non-believers and was martyred. Raja's army got feared and ran away from the battle. The muslims army was victorious and marched forward. When the army reached at location of now-a-days Aiman abad road, it had its 2nd Battle with the army of Raja Sahenpal. Raja's army fought vigorously to safeguard its reign. But muslims were full of belief of Jihad and paradise in after life. Imam Sahib (RA) army defeated Raja's army in this battle also. Imam Ghalib (RA), another brother of Imam Sahib (RA), fought with heart full of divine devotion and was also martyred in the name of Islam. Imam Sahib (RA) marched forward towards the castle. Raja Sahenpal's army was retreated from 2nd Battle and consequently, Raja was forced to take refuge in his castle along with his balance army. Imam Ali ul Haq (RA) ordered his nephew Syed Surh Ro, "Maghrib prayer will be offered inside the castle, therefore it is absolutely imperative to enter into the castle and make the conquest in the name of Allah". Imam Sahib's words filled the hearts of his army with devotion to true love of Islam and invaded into the castle raising slogans "Allah-hu-Akber". Imam Sahib conquered the castle and the city. Mr. Naveed Sultan in his same book "Sialkot in the mirror of spirituality" states that other sources which confirm that Imam Ali ul Haq was the 14th Caliph of Hazrat Ganj Shaker (RA), they say that Imam Ali ul Haq didn't come to fight Jihad in Sialkot. Rather he came to spread Islam peacefully under the oath of Hazrat Baba Ganj Shaker (RA). The reality of his arrival is best known with Almighty Allah, but it is true that thousands of non-muslims of Sialkot, converted to Islam due to Imam Ali ul Haq (RA) divine spirituality. He lived in Sialkot for several years and inspired local non-muslims with his spirituality. As a result thousands of non-muslims embraced Islam on palm of Imam Ali ul Haq (RA). He devoted his life, to teach the golden virtues of Islam to the citizens of Sialkot at that time. He practiced Islam in Sialkot, with such a spirit that endeavored him as blessing upon the poor and needy, a role model for common muslims and even non-muslims and real shear for the suppressive reigns. Mr. Ashfaq Niaz in his book "History of Sialkot", states that 686 Hijri was the year, when the great sufi saint Imam Ali ul Haq closed his eyes to start his passage towards the heavens. Imam Ali ul Haq bin Syed Hasan Makki bin Syed Ahmed bin Syed Yousuf bin Syed Ishaq bin Syed Hashim bin Syed Abdul Razzaq bin Syed Arbi bin Syed Mohammad Saleh bin Syed Ali Akber bin Syed Tahir bin Syed Mohayyudin bin Syed Abdullah bin Syed Abul Hasan Ahang Ahmed bin Syed Musa bin Syed Ibrahim Asghar bin Syed Imam Musa Kazim bin Syed Imam Jafer Sadiq bin Syed Imam Baqir bin Syed Imam Zain-ul Abedin bin Syed Imam Hussain bin Hazrat Ali (RA). Down a small side street in the old part of the city is the shrine of Hazrat Imam Ali-ul-Haq (RA). This shrine has been visited in the past by Emperor Akber. During the reign of Sikhs, Sardar Ganda Singh & Sardar Jhanda Singh disgraced the shrine for several times. But during Ranjeet singh era, the later sikh ruler, stopped this practice. Path leading to the tomb is often lined with numerous prostrating pilgrims. The mausoleum complex is a maze of narrow corridors leading to several shrines of pirs (saints). The tomb of Imam Ali-ul-Haq is to the right, through a mirrored gateway tiled with Koranic inscriptions and geometric designs. The courtyard is a fascinating place to sit and absorb the atmosphere. To the rear is a small graveyard where drumming, devotional singing and dancing takes place by the devotees. There are graves of the parents of Allama Iqbal in the adjacent grave yard to Imam Sahib. Every Thursday, a folk fare is organized in the adjacent ground of Imam Sahib, attended by hundereds of people. Although Imam Ali ul Haq (RA) is not present physically, but the city of Sialkot is bestowed with his spirituality and love to Islam forever and his tomb will remain as regional center of harmony, devotion, courage and belief in God amongst the Muslim hood.